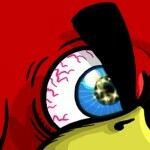 Here is our walkthrough strategy for Angry Birds Rio Treasure Hunt Level 35. That must be close to total destruction. For my 193800 score, I think there were only 3 pieces of damaged concrete left. I put a little more arch in my shot. Otherwise same result as the video. It was a matter of many plays and resets until I got above 190k and with that it’s time to move on. Congratulations to @klara-van-emden for high score on this level and tops in Treasure Hunt. Nice flinging. I came to post my score with 184K thinking I was certainly above average. What a shock to see I was still 4K shy. @mg516 strategy of using a higher arch to hit the branch on the way down is fantastic! This allows the bomb bird to drop lower and detonate next to the TNT for maximum destruction. No kidding about the high average for this level. I thought the same thing!